Finally, a WordPress theme that doesn’t look like a WordPress theme (and let’s face it, there’s definitely a WP “look” out there that is starting to get a little overwhelming). Studio premium WordPress theme was designed for small businesses that need a beautifully simple solution for a web presence, without the distinct look of most WordPress themes. 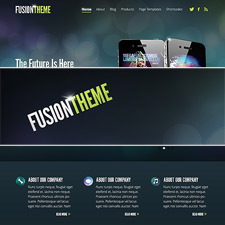 Studio premium theme was created with several fixed height options, so that the whole site can be displayed above the fold for a clean, modern look. 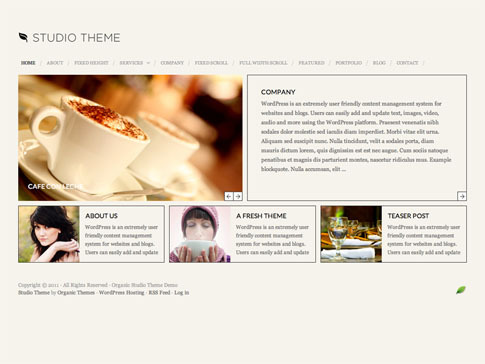 Studio theme features an abundance of page templates and layout options. Several page templates include the option for scrolling content using a custom designed scroll bar. 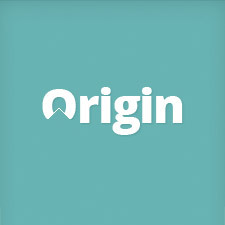 OrganicThemes created Studio theme with customization in mind — a few minor changes can make the theme unique to your brand. Check out the demo at the end of the post!